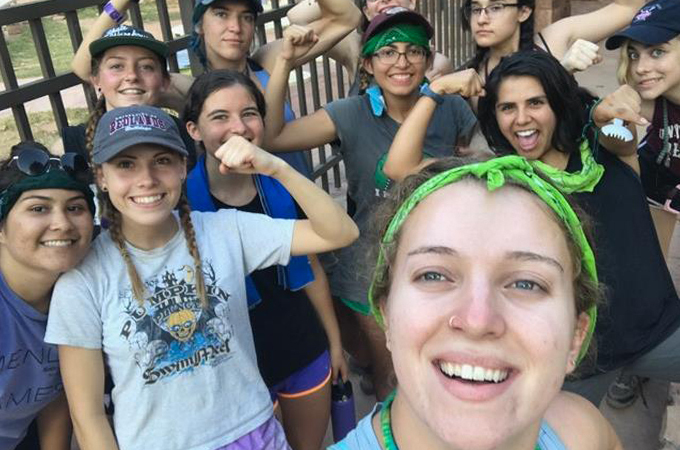 Emma Fortmiller '18 (bottom right) poses with the group of young women she led on a First Year Journey trip to Havasu Falls in Arizona. Before my freshman orientation week at the University of Redlands in 2014 (wow I’m old), I signed up to go on a First Year Journey, an FYJ, to push myself out of my comfort zone. Back then, I was not the type of person who would willingly not shower for five days and be forced to walk uphill with 50 pounds of food, water, and clothes strapped to my back. But I figured that the experience would outweigh the pain and suffering I would get, even though I didn’t break in my hiking shoes enough and had to carry all that water (who knew water could be so heavy?). I had absolutely no clue what I was doing, but something beautiful came from the experience. I met incredible people, stayed really hydrated, slept under the stars for the first time, and found my love for the outdoors. I was high on life post-FYJ and knew that Outdoor Programs was the place for me on campus. Every time I felt lost at the U of R, an outdoor adventure with Outdoor Programs would steer me in the right direction. It took me a couple semesters, but I finally found myself applying to be a trip leader, and I was accepted to be a trip leader apprentice for the fall of 2015. Being a trip leader was easy. I finally found myself surrounded by likeminded people. People who enjoyed getting away from the craziness of college and the stress of everyday living. People who actually liked not using their phones for a few days. People who liked a breath of fresh air, figuratively and literally. With Outdoor Programs, I was home. Part of being a trip leader with Outdoor Programs is understanding that FYJs are some of the most important trips we lead. Try and imagine 100-plus stressed out almost-freshman who choose to leave home a week early arriving on campus—or maybe you were one of them and you completely understand. They haven’t been to college yet, most of them don’t know each other, and it’s up to us as trip leaders to foster an inclusive, inviting environment that will help them feel welcomed. To top that off, they all hop into white vans with strangers and get thrown into the outdoors for four nights. I mean, it’s not as sketchy as it sounds, but down to its core, that’s pretty much how it goes. "Havasu is special. 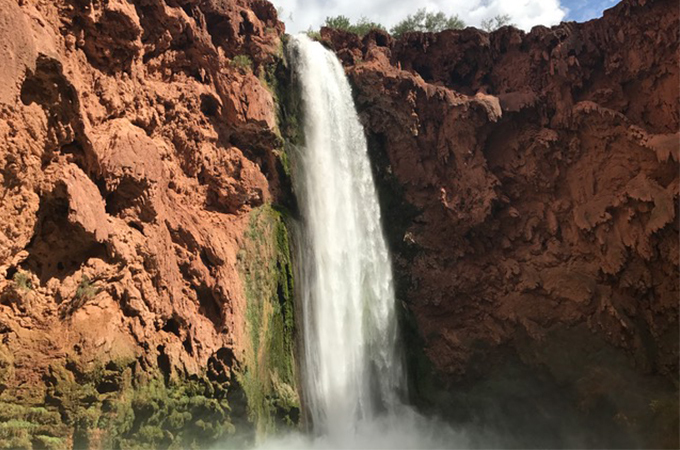 It’s a part of the Grand Canyon with gorgeous green-blue waterfalls, deep orange rocks, and thieving squirrels," says Fortmiller '18. I knew that my summer would be ending early for FYJ, but didn’t realize how much my summer would change because of it. I found out I was leading Havasu Falls in August and felt excited. It was third on my list, permits are hard to get, and I probably wouldn’t have gotten the chance to visit it otherwise if I wasn’t going through the University. And as quickly as my summer ended, I was on campus, in training, watching the partial eclipse, reconnecting with my “OPeople,” and hopping in a white van with a drive of seven and a half hours to Havasu. Havasu is special. It’s a part of the Grand Canyon with gorgeous green-blue waterfalls, deep orange rocks, and thieving squirrels. There are three ways to get to Havasu Falls: by helicopter, by horse, or by foot. We chose the latter and spent 10 hours hiking down in to the canyon, starting at 4:30 a.m. to beat the heat. As a leader, backpacking in Havasu offers several stressful scenarios: rattlesnake bites, flash floods, tarantulas crawling in to sleeping bags, and a lack of clean drinking water. But as a hiker, backpacking in Havasu is so beautiful. It’s exhausting but exhilarating, and with each step you take you know that you’re that much closer to seeing the falls for the first time. The group of young women I led were powerful, strong, and confident. Many of them had never backpacked before, and to conquer something as challenging as Havasu just goes to show how committed and ready they were. If they could tackle the 20-mile trek in and out of Havasu, they could definitely tackle the world of college. Some of the best moments on this trip were when my co-lead and I could sit back and watch “our girls” create lasting memories. They’d laugh playing “never have I ever” and cry during challenging moments and conversations. They never gave up hope and proved themselves to be empowered, strong young women. I want to give a shout out to my Havasu girls (or as they call themselves, the Havacrew) for being so amazing, and a shout out to Idyllwild FYJ 2014—y’all are amazing too!